I got a letter today from Service Canada that told me that my application for Old Age Security has been accepted. It’ll be a while before the money starts rolling in, but I definitely am on my way to the winter period of life. Just as well I suppose, because when I was in the drugstore today the cashier asked me if I was over 65. It was seniors’ day after all. Anyhow this got me thinking about one of my favorite old songs – one my Dad used to love. It’s called “September Song.” His favorite version was by Frank Sinatra, but I think mine is by Jimmy Durante. Yes, I know Lou Reed also recorded it but give me some credit for taste. So here are a few details on “September Song” for your reading pleasure. It was written by Kurt Weill and Max Anderson in 1938 for a Broadway musical featuring Walter Huston – great actor, no singing voice. Apparently the writers dashed it off in a couple of hours and made it as simple to sing as possible. These precious days I’ll spend with you. We’re off on another cruise in a week or so. We got started with cruise vacations rather late in life, but now we like them a lot. This will be our 10th one – all with Celebrity Cruises. Sticking with the same cruise line – assuming you like their style of cruise experience – is a good thing, because eventually you start getting some nice perks. We now get free Internet and laundry service, a lounge with drinks or specialty coffee provided, and priority tendering and departure facilities. We’ve also enjoyed galley and bridge tours. We’ve had cruises on a wide variety of Celebrity ships – from the smaller more intimate Celebrity Zenith up to the brand new megaship Celebrity Equinox. Right now I have to say we like the big ship best. It’s very comfortable in all sorts of weather, has lots of facilities to keep you happy on sea days and we really like the way they have organized the dining experience. Last year we went across the Atlantic on the Equinox. This year we’ll be cruising down to Panama and South America. It’s a tough job, but somebody has to do it. Oh sure I loved Mom and Dad when I was a boy growing up in the Leave It To Beaver era. However my favorite adult for a lot of that time had to be my Grandpa. He was quite an old man when I arrived on the scene. 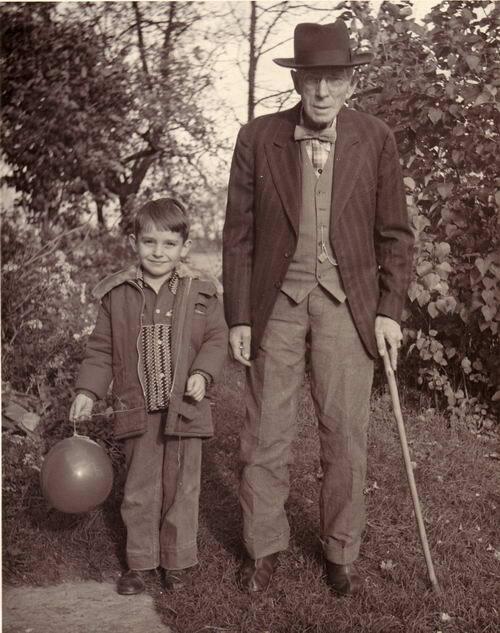 Here’s a pic of us in 1955 when I was 9 and he was 80. However Grandpa lived until age 91 so I have a long and vivid memory of his presence in my life. I mention this now, some 60 years later because nowadays I have my own 2 year old superfan in the making. His name’s Teddy. I am not sure I can channel my own Grandpa – certainly I’ll never be able to compete in storytelling – but I’ll give it my best shot. I’m a bit younger at this stage of life and God willing I’ll be around awhile to provide lots of memories for Teddy as he gets older. At the end of the day I suppose that’s the goal of any Grandpa – sit back and enjoy watching a little boy grow up. I am pretty much a Linux guy when it comes to the PCs around here. Mind you, most of them are older pieces of hardware where Linux runs very well. One machine is fairly new but I didn’t want to be bothered paying for its operating system, or getting involved with licensing hassles. I just installed Linux from the start. Up until recently I had just one Windows machine in the stable – and that was my Windows XP based Dell Optiplex GX620 desktop from 2005. I still use Windows for a few essential applications, and I expect to continue to do so. Windows XP is getting pretty antiquated, and security support will end in a few years. At that point I would have to abandon Windows completely and go strictly Linux, or move on to some sort of Windows successor O/S. That’s all changed with the purchase of this Windows 7 equipped Dell Inspiron notebook I’m using right now. Mind you, it’s got plenty of hardware muscle – quad core processor, discrete graphics, scads of RAM, big hard drive. However, Windows 7 is tuning out to be a pleasure to use. First of all, it is rather minimalist in comparison to Vista. The sidebar is gone, and gadgets are completely optional. The taskbar at the bottom of the screen handles launch icons and minimized Windows buttons with ease. Second, it is very quiet. Information popups are kept to a minimum and you only see the User Account Control when you are making a major change to the system like installing a program. Security suites like McAfee run unobtrusively and don’t have much effect on performance as far as I can determine. Third, the Aero interface is very attractive and has some nice features without being too glitzy. Finally Windows 7 comes with some nice Windows Live! applications like Windows Live Mail and Windows Live Writer (for blogging.) I am still not that crazy about Internet Explorer or Windows Media player but there are good alternatives available like Firefox, Google Chrome and Songbird that work very well. To sum up, Windows 7 is A-OK with me. It is a worthy successor (finally) to the aging XP, and far nicer to work with than the bloated and annoying Vista. I’ll have no problems if some day I have to replace my Dell Optiplex XP desktop with a Windows 7 machine. And what would happen to that old desktop? I can see Linux in its future. The Brockville and Ottawa Railway has had several names over its long and interesting history - B&O, Canadian Pacific, Ottawa Valley Railway - but no matter what you call it, it's being taken off life support. This fine old railroad - which traversed Canada's first rail tunnel, carried the Prince of Wales in 1860, and was the scene of one of the worst train wrecks in Canadian history in Almonte - will die today (February 5, 2011.) It hasn't been in use for close to a year and the last opportunity for anyone to buy it as a working entity ends today. CP will tear up the tracks, and probably the counties of Lanark and Renfrew will buy the roadbed for recreational trails and possible re-use if ever needed. This railway was a major contributor to the industrialization and settlement of many of the Valley towns in the 19th century, but today it's really a road to nowhere. It can't really serve as a commuter railway as most traffic runs perpendicular to it on roads to Ottawa. The last viable Ottawa commuter line near Almonte disappeared over 20 years ago. CP doesn't need it for slow, heavy, long haul freight transfer either, and there's no local rail traffic between the small de-industrialized towns it formerly served in the Valley. Perhaps some of it would make a nice scenic tourist railway, but I don't know how the Carleton Place suburbanites or the inhabitants of Almonte's poshy downtown condos would like a smoky old Ten Wheeler or light Pacific chugging past their homes in the summer heat. Besides, Ottawa's already got a steam railway for the tourists. So after 150 years the lonesome whistle will no longer sound in Almonte. There's a nice old railway bridge over the Mississippi that'll be great for pedestrian traffic, and not much else. I've been using a Linux powered Acer Aspire One netbook for a while now - during that time I switched from its native Linpus Lite to Ubuntu Netbook Edition. However I've become increasingly dissatisfied with its performance as a portable PC at home. Don't get me wrong - I'm not junking it completely. For travel it's a terrific companion - lightweight and robust with its solid state hard drive. It's great for checking email or some light web surfing. It crams into a backpack along with my digital cameras and never complains. It backs up my photos on the road. However it is not a good machine for portable use around the house. It's underpowered, memory challenged, and very slow for even the simplest Web tasks. The tiny screen is OK in a hotel room, but I longed for a bit more real estate in the living room. The fact it runs Linux mitigates the problem some, but even without the CPU sucking security apps the Aspire One is a laggard. It's sort of like using a laptop from 2001. So I have been tempted for a while to replace the netbook with something that is a little more functional. I don't want to be tied down to a desktop all the time, but I don't want to stare at a tiny screen and wait... and wait... and wait... either. There's an additional point to all this - I really want to learn more about Windows 7. Many of my "clients" in the Almonte seniors community are getting over their Vista phobia and replacing their XP hardware with Windows 7 machines. If I'm going to continue to help them with simple troubleshooting I need to have some experience with this latest version of Windows. The net result was that a couple of weeks ago I decided to buy a new Windows 7 notebook. I decided on a Dell Inspiron M501R. This is a 15.6 inch consumer grade Dell laptop - I decided I didn't need road warrior capability or durability. I also decided to go with AMD technology. I know Intel has a technical edge in processors, but AMD has good reliable hardware and I believe a slight edge in the graphics arena with their Radeon GPUs. I got a quad core Phenom II CPU and a discrete Radeon 550v graphics unit. AMD calls that combination Vision Ultimate and it should be more than I need for most tasks. Anyway I customized my machine on the Dell website, my order sped off to Xiamen China where the system was screwed together in Dell's factory there. Then it headed off to Nashville TN for final boxing and shipping to Toronto. From there Purolator brought it to my door in Almonte. All this took 10 days from start to finish. I've been playing around with my new toy since Monday - typing this post on it now. I've found it to be a powerful, smooth and responsive machine - its graphics are significantly better than either of my aging desktops (2205 and 2008 models.) It's more than capable of running the snazzy Windows 7 Aero interface. As for Windows 7 - I like it a lot, and I'm a dedicated Linux user. It seems solid and unobtrusive (a far cry from the annoying and bloated Vista O/S I've encountered when trying to fix a few problems at certain neighbors.) It does have User Account Control but it's like a well behaved Linux install - doesn't jump in your face at every keystroke, and doesn't dim the screen while it waits for your confirmation. I wouldn't hesitate to tell any Windows XP devotee to switch over to Windows 7 when they replace their system. So it's the end of the netbook era at home. But the little Aspire One will be in my backpack and off on another journey one of these days.